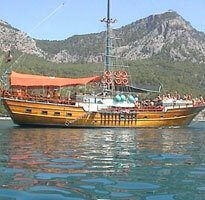 Day 1 : Boat departs around 10am from Fethiye. Butterfly Valley - Blue Lagoon Oludeniz - St. Nicholas Island (1st night). Day 2 : Firnaz Bay / Kalkan - Hidayet Bay - Yacht Harbor Kas - Sicak Bay / Aperlai (2nd night). Day 3 : Sunken City Kekova - Simena Castle - Pirates Cave - Gokkaya Bay / Smuggler’s Inn Disco (3rd night).